Newer inmates report having a difficult time making friends. 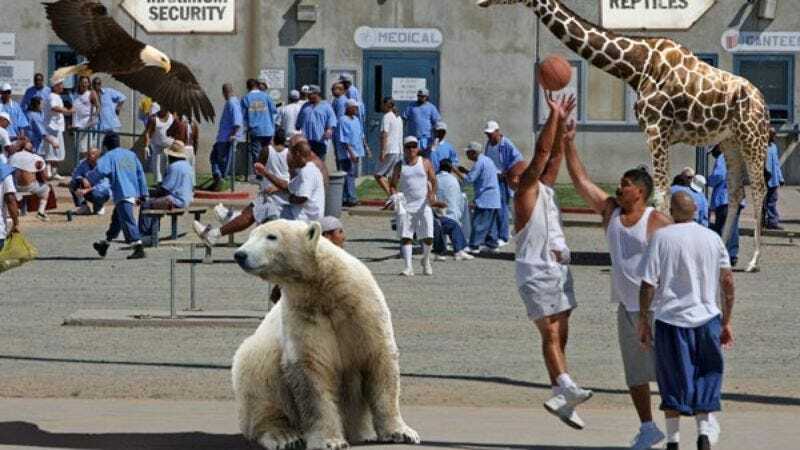 SAN DIEGO—Plagued by a lack of funding and growing staff shortages, the San Diego Zoo and Ironwood State Prison were combined earlier this week, bringing local inmates and wildlife together for the first time under the same roof. The new state-of-the-art facility—which will house 12 separate cell blocks, a reptile house, two weight rooms, and a primate sanctuary—is expected to save the state of California up to $5 million in operation costs over the next year. "It is with great pride that I announce the opening of the San Diego Maximum Security Zoological & Convict Reserve," director David Hennessey said at an opening ceremony Tuesday. "From southern white rhinos to repeat offenders serving 20 years for drug trafficking—you'll find them all here at our amazing new facility." Construction on the resource-sharing project concluded last Wednesday, after which felons and fauna were carefully transferred to their new joint living space. According to Hennessey, the 40-acre facility features one of the largest collections of migratory birds, hoofed mammals, and hardened inmates in all of North America. "This is, without a doubt, the only facility of its kind," said warden Jeff Thurston, noting the zoo-prison's authentic natural environments and thick bullet-proof glass. "At any given time, visitors may be able to spot as many as three parole violators and up to five adult black bears in the same holding cell. During scheduled feedings, that number may be even higher." The San Diego complex is open to schoolchildren on field trips, family members of convicted felons and state-appointed defense lawyers, and is expected to help boost the city's struggling tourism industry. Thurston said that visitors have so far responded favorably to the new facility, with many citing the "Emperor Penguin And Death Row" exhibit as their personal favorite. The complex will reportedly also feature a number of "Scared Straight" talks each week, during which young visitors will simultaneously learn about the dangers of breaking the law, as well as what happens when a male lowland gorilla suddenly feels threatened. "I got to see the little baby pandas, and the monkeys, and the zebras," said 8-year-old Michael Nayman, who was taken by his mother to the part-zoo, part-prison compound. "And then I went and saw Daddy. But he wasn't as much fun as the pandas. He just sat in his cage and cried a little." Despite a positive opening day, officials admitted that the San Diego facility has experienced a number of setbacks. On Tuesday, a scuffle in the shared cafeteria forced officials to fire a series of elephant-tranquilizer shots, leaving three inmates unconscious for days. In addition, a red-tailed Indonesian peacock was found stabbed to death on Thursday, after a group of prisoners accused the three-foot-tall bird of flashing colors of a rival gang in their direction. "We've been forced to expand our infirmary unit nearly tenfold in the last week," chief nurse Margaret Hodge said. "Unfortunately, the arrival of rhinoceros mating season has made things worse, leading to the gruesome deaths of almost 50 inmates in our communal showers." According to officials, the institution has also suffered from three recent breakout attempts, including an ill-fated effort last Friday by Enrique Gonzalez, 36, to scale a reticulated giraffe up and over the compound's barbed-wire perimeter fencing. In addition, a 280-pound Bengal tiger was accidentally granted parole after its file was confused with that of mail-fraud convict Cole Bucholz, 47. Since the merger, officials at San Diego Zoological & Convict Reserve have received a record 600 requests from inmates wishing to be transferred to another maximum-security facility. In addition, officials have received 20 requests from inmates begging to have the dates of their execution pushed forward. "I've been in a number of prisons in my life, but nothing compares to this," said inmate Casey Ingersoll, who despite previously committing violent murders was still horrified after witnessing a fellow convict ambushed by three Komodo dragons. "If I stay here much longer, I'll have to join up with either the Anteaters or White Supremacists for protection." While many local residents support the new facility, particularly due to the large number of jobs it has created, some have recently spoken out against the Zoological & Convict Reserve. "To see all those poor souls forced to live in confined living quarters, with little to no sunlight, and no hope of freedom, it's just so inhumane," San Diego housewife Carol Wurster said. "Those otters deserve better."